Will Elton Brawn strong-arm Amelia Earhurt into a loss? Or will she be squeezed out by Taylor Fist or Aunt Nance? 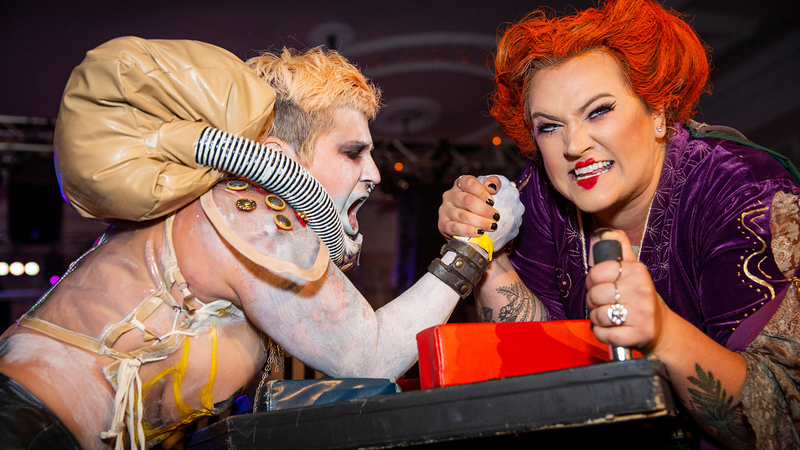 It’s anyone’s guess at the Chicago League of Lady Arm Wrestler’s upcoming event: CLLAW XXI: Fall Brawl. Get in on the action by betting on your favorite wrestlers with local tender (CLLAWBUX) or slip referee Beau K a few to even the score. All proceeds benefit Sideshow Theatre Company and GirlForward. Explore soaring skyscrapers, private clubs, industrial factories, ornate theaters and trendy offices at Open House Chicago. Hosted by the Chicago Architecture Center, the annual event invites the public to tour more than 250 architectural treasures across Chicago. Note: Some sites require advance registration, while others are open exclusively to CAC members. We suggest wearing comfy shoes and checking hours before heading out the door. Gear up for an invigorating afternoon at the Coffee & Chocolate Tasting Party, where local coffee roasters’ best pours will be paired with sweet treats by Katherine Anne Confections. Sip samples from Ipsento, Passion House Coffee Roasters, Bru Coffeeworks, Metric Coffee and Colective Coffee. Meet some of Mexico’s most prominent folk artists at the 13th annual Folk Art Festival, including Jacobo Angeles Ojeda whose alebrije work inspired Pixar filmmakers to include the figures in the movie “Coco.” See demonstrations of woodcarving, weaving, decorating of sugar skulls and more. Toast the classic tomato juice-and-vodka cocktail at Bloody Mary Fest, where you can sample 10 concoctions by local bars and restaurants, and vote for your favorite. Enjoy sweet and savory brunch bites while soaking up views of Lake Michigan. Lawn games and an artisan market are also on tap. Mingle with elected officials, candidates and activists at the March to the Polls 2018. Organized by the Women’s March Chicago, the event is designed to inspire voter turnout and honor first-time voters. New this year is a Voter Village, featuring candidates running for office, activist organizations and businesses. Rally activities begin at 10 a.m. and will include a speech by civil rights activist Heather Booth. A march through the Loop starts at 12:30 p.m.
Chicago and Cook County residents are encouraged to (literally) march to the polls and use early voting sites in downtown Chicago. Theater hits the streets with performances at historic sites in Charged Spaces/Changing Bodies. Presented in conjunction with Open House Chicago, the performance begins at the Institute for Cultural Affairs with “Notes on Territory,” which addresses “containment architectures.” Audience members are then led across the street to Lawrence House for performances of “Les Chanteuses du Rien,” a mashup of classical music and experimental opera, and “Five Stud Stud,” an exploration of the spectrum between violence and tenderness. Expand your craft brew horizons at Far & Away, where you can sample selections from national breweries like Upslope Brewing Company and Creature Comforts Brewing Company. Hosted by Half Acre Beer Company, organizers say they wanted to introduce locals to brewers (and a few wineries) who “share a similar idea on what brewing is about.” A portion of proceeds benefit music education for Chicago youth through Intonation Music Workshop. All aboard! Tour a restored Illinois Central locomotive and caboose at Homewood Hobo Night while learning about those who rode the rails from town to town in search of work. M.G. Bailey serenades attendees with train-themed songs and sing-a-longs. Enjoy s’mores and a sample of hobo stew created by Redbird Cafe for the occasion. No need to wait till Halloween to get into the spirit. Bring your little ghouls and goblins to Boo! at the Zoo to trick-or-treat, see pumpkin carvers and create Halloween crafts. Take a haunted hayride, go for a spin on the creepy cowboy carousel or wind your way through a corn maze. Learn more about animals associated with the holiday – like bats, spiders and ravens – at special zoo chats throughout the day.